Fresh, elegant decor in every suite makes it a little less sad to leave the beach. Catch a peaceful hour on the lanai. Crazy Eight, Knock-Off, Tap and Draw - pick a game. The sights are endless, from beachfront strolls to the lava rock grottos. Lounge alongside any of the three pools until it's time for an evening feast. This smaller property gives it a warm community feel. Plantation Hale Suites is conveniently located in the heart of Wailua, close to the area’s best shopping, dining, and beaches. There are three outdoor pools to choose from. Grab the sunblock, pool toys and magazines and get ready to hit it. Go for a swim or set up camp poolside, get your tan on and keep an eye on the little ones. When the kids get hungry, fire up the BBQ grills for a fun family cookout. Now the only question is: hot dogs or burgers? If you’re not up for cooking, check out the five-star restaurant Hukilau Lanai, it’s just across the street. Up for some relaxation? You’re in luck! Spa Makaiwa is a short walk from the resort. Unwind with a massage, facial or body treatment – you deserve it. One-bedroom condos sleep four to six guests and offer garden, pool or scenic views. Standard condos have one king or two double beds. If you really want to get fancy, book a Deluxe condo, they are upgraded. All condos have full kitchens with enough space for your local farmers’ market finds, or stop by the local Safeway. And the complimentary Kauai Coffee tastes even better out on the lanai. Your condo has plenty of room for movie-night blanket forts. Flatscreen TVs have cable and Blu-Ray/DVD players. Pack movies from home, or check out the resort’s DVD library; it has over four-hundred choices! Call everyone into the living room, grab a selection of snacks and get comfortable. The on-site laundry facility will come in handy when someone gets candy on their shirt. Fans of super-short condo-to-beach distance will love the setup at Plantation Hale Suites. It’s an easy three-minute stroll to the sand – maybe a little longer if you’re loaded up with boogie boards, towels, sunscreen, and snacks. 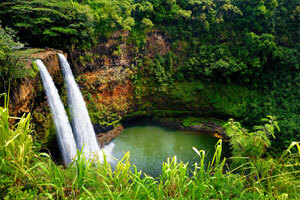 Visit the nearby Kauai Coffee estate for tours and tastings. Or check out rustic Kapaa Town for souvenir-laden markets, galleries, and boutiques. Coconut Marketplace features unique boutiques and shops. If you’re looking for souvenirs or gifts for loved ones back home, check out Del Sol Hawaii, Jungle Rain or Auntie Lynda’s Treasures. You can find apparel at Na Koa Surf Co., Crazy Shirts or Suzi’s Young Fashion. Be sure to stop by Bobby V’s Italian Restaurant Pizzeria for a slice of pizza or a calzone before heading back to the resort. - Front desk is open from 7:00 AM - 11:00 PM daily. Guests that arrive after hours must use a phone located to the left of the front desk to call security who will provide keys to the unit. Guests need to complete check-in with the front desk the next morning. King size or Double bed configurations may be available upon request depends on your room. -Minimum Spring Break check-in age is 21 years old. -The name on the credit card used at check-in to pay for incidentals must be the primary name on the guestroom reservation. Reservations are required for massage services and spa treatments. Reservations can be made by contacting the condo prior to arrival, using the contact information on the booking confirmation. Children 18 years old and younger stay free when occupying the parent or guardian's room, using existing bedding. Only registered guests are allowed in the guestrooms.